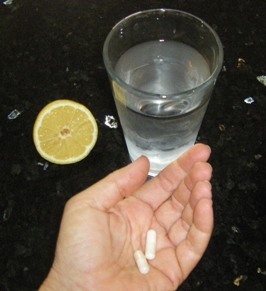 Taking medications with lemon water? I'm suppose to take my thyroid medication on an empty stomach each morning. I also take my water tablet at this time. When should I drink the lemon water? I don't want the lemon water to interfere with my medication. As always, it is important to consult with your physician about medications. Every medication has different contraindications with food, beverages and supplements. Thus, I can't advise since I don't know all the details and I am not a medical practitioner. What I would do if I were in your shoes is that I would ask my doctor how long after taking the medication I should wait to eat or drink anything. Thus, in the morning I would take the medication, wait whatever time frame my doctor advised (I would guess it would probably be about 30 minutes) and then drink the lemon water. Ideally, you would want to drink lemon water about 20 to 30 minutes before breakfast to help with digestion and utilization of nutrients from your food. Drinking lemon water in the morning is the most beneficial time to take it because doing so will help flush out the toxins that your body has collected for elimination throughout the night, while you were sleeping. But if waiting to drink lemon water after your medication and before breakfast does not work out with your morning schedule, I would just drink your lemon water about 30 minutes before lunch or dinner if possible. And if you have a full-time job during the day, then you could always drink the lemon water about two hours after dinner. This would also be beneficial to assist your body's natural detoxification process that occurs while you sleep. However, you don't want to drink too much water right before bed for obvious reasons. Bottom line: Don't worry too much about when you drink lemon water throughout the day. It will be beneficial at anytime.